See how selfish I was coming up with the Citrus theme for Sugar High Friday? !...Gave me the "excuse" to make lemon desserts almost every other day...I know, I am evil! Not made your entry yet? That's ok, you have until next Sunday (May 25th) to do it. 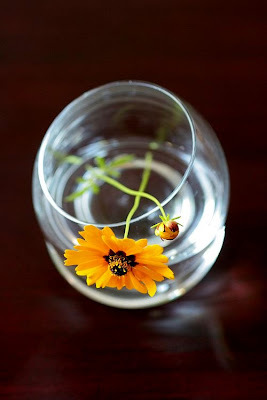 One whole week....And remember, citrus does not only include lemon or lime and the entries I have received so far have been really creative in making different citrus fruits the stars of their creations or an accent to a dessert that takes the whole dish to another dimension. I know you would not mind a teaser...hmmm....No can't do! But what I can do is to make you some Lemon Madeleines to ease the wait of the round up on the 30th. Before I forget, because my brain is more scattered than the madeleine crumbs on the breakfast table right now: the "handmade with love" tag attached to that cool ribbon was actually part of a gift that one regular reader of this blog, Bina, sent me. She does not have a blog but emailed me a few months ago with a macaron question (with pics which was precious to help her out) and we have continued emailing even after she had "mac-success". Well, this little busy bee cross-stitched a couple of towels for me, one with lemons (!) and one with ice creams, and when I went to take the picture I had the tag in my pocket so it ended up on the plate...which also has a story: it made a long trip from Inne's home to mine but it was just the perfect size for the madeleines. She was sending me a much coveted book and "hid" the fact that there was china and chocolate in it. Spoiled, I tell you...I am spoiled...Thank you both from the bottom of my heart. Madeleines were almost always part of the cookie tray my grandmother would put together for our daily afternoon tea. Since there is only one house between my parents' and theirs, the ritual was to go over there around 4pm and sit down together for tea and cookies and talk about the upcoming weekend gatherings, dinner, birthday parties, communions, etc....With a big family like ours, it seemed like there was always something to celebrate and get together for. It was fairly common to buy madeleines instead of making them and with a great bakery in the village it was easy to pop a dozen in the basket while getting bread in the morning. I loved their distinct bakery-orange blossom flavor, their dense almost pound cake like texture, their sticky exterior, and most particularly their giant dome on top...or back...depending on which way you hold it. Really, I would sit there for minutes on end just holding one, staring at this big, puffed round of cookie wondering how on earth such a classy scalloped treat could end up looking like Quasimodo. And then, I would eat it, forgetting about my questions until the next time we would gather for tea. While others were pondering over e=mc2, I did spend a great deal of my childhood wondering about the dome of madeleine, which probably surely explains what I do nowadays for a living. I think it is more about reminiscing about home that I like seeing my madeleines puff up in the oven since the taste is the same whatever the shape they end up taking! In a large bowl, mix together the flour, baking powder, sugar, pinch of salt. Separate the egg whites from the yolks, and whisk in the yolk to the flour mixture. The mixture will appear quite thick, do not feel like you have to whisk in all in thoroughly. In a separate bowl whisk the egg whites until foamy, and add a small amount first them to the egg yolk/flour mixture and whisk vigourously with a whisk to break the flour/yolk lumpy mass. Fold in the rest of the whites with a spatula. Add the lemon juice, zest, and butter. Whisk the batter until everything is incorporated and smooth. Drop one tablespoon or so into the madeleine molds, depending on their size. Do not fill them to the rim though. Bake for 8 minutes or until golden brown. As soon as they come out of the oven, squirt the half lemon over the madeleines and let cool completely before proceeding with the glaze. For the glaze: mix the powdered sugar, lemon juice and zest together until you get semi thick consistency. Add more lemon juice if needed. Dip each madeleine in the glaze and set them on a wire rack over a baking sheet lined with parchment paper. For madeleine pans and molds, check here for metal and silicone. Oh yes, Helen, it's actually exactly 4pm so maybe I just arrived on time for tea time? Wonderful madeleines... I love that last photo of the flower and congrats on the big win!!! Haha no worries, Helen - I'm GLAD that you picked the citrus theme for this month's SHF!! I PROMISE that I'm going to make the deadline for SHF!! I think today I will use the madeleine pan I bought 3 months ago and have not yet used. And again congratulations on the win. 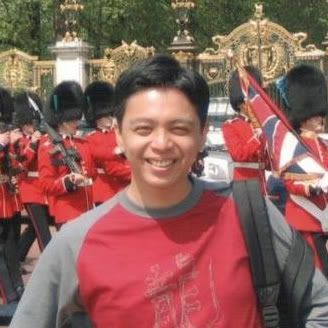 As soon as I saw your photo with the LIVEstrong band on the macarons, I knw it would be the winner! Congratulations. Congratulations on your win! It's a brilliant shot. And the madeleines look yummy with the icing dropping on the sides... Would be great with my evening tea! madeleines with glaze...mmmm! i just made madelines yesterday and will be posting about them soon. i didn't get the bump--frustrating! and congratulations...the photo of the macarons is beautiful. Can't wait to see all the SHF entries! These look delicious! Like abby, I've also never made madeleines, but I'd certainly like to. I also really like that you included a glaze. My hubby is the madeleine maker in our house (lucky me!) -- and though he generally makes vanilla or sometimes almond, I am partial to the lemon ones. I keep seeing madeleine pans and I keep looking for an excuse to buy them. I think I've found one! Thanks. I just finally bought a madeleine pan yesterday but haven't had luck with the recipe I've trues so far. I'm going to try one of yours next. Congrats on your photo win - I loved that shot too! I seriously need to get a madeleine pan! I promised myself "no more kitchen things" until I get a bigger kitchen but now you have me thinking about breaking that promise so I can get a madeleine pan. hi tartelette. this is my first time posting on your blog. i am thinking of making an opera cake with passionfruit and rhubarb. would it go together? Helen, those are very appetizing madeleines! I love that you present them with the hump on top, a sure sign you're French! Interesting that you serve them all weekend long, do they stay good that long? Mine go stale quite quickly. I've just one thing to say mmmmmmmmmmmmmmmmmmmmmmmm lemon!!! I love lemon anything, add cake to it and it is even better. I have a pan tucked away in storage. I have an extra special reason to give them a try again. Lovely photos as always. What beautiful madeleines. And I love the idea of the glaze. Congrats on the LiveSTRONG win! You absolutely deserved that (and now may I eat the macarons?!) ;) Mmmmmm lemon is so delightful in just about anything. You work magic, my dear. I want to make madeleines, but I am reluctant to buy yet another single-purpose pan. Maybe I should buy one of those kitchen remodel and expansion kits too? ah ha ha ha. Your treats are always mouthwatering and lovely. Your pictures and recipes are always mouthwatering. Congrats on the win! I'm glad that you were :"selfish" in choosing a citrus theme this month for SHF - I'm loving it! These madeleines are very cute. And congrats on your LIVEStrong photo comp win. The recipe up for Tuesdays with Dorie is Madeleines. I will use your glaze for mine if thats okay. Congrats on your win with your macaroons. You are the BEST. I am always drooling on your site. You are so very inspirational. Congratulations on your well-deserved win! :) I would give you an award just for your beautiful madeleines! 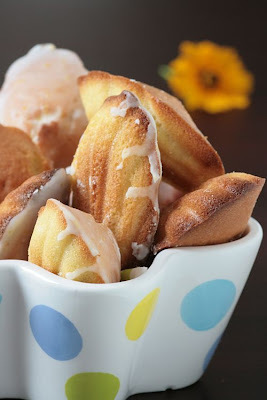 I still have to get my act together to make something citrusy this month, those madeleines look wonderful! How lovely with that dripping frosting. You are evil! I could lick the screen. Congrats of the picture of the macaroons. I made some too on Friday with strawberry filling but they turned out too crunchy. 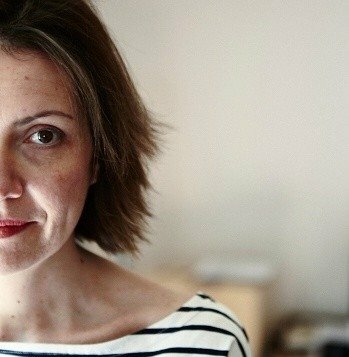 What an amazing thought Helen - if only our grandmothers could have had blogs! And congratulations on the cool macaron win!! Congrats on the win! Well deserved. Love the madelines! I need to master them....have a tendency to mess them up...badly. Yours look mouthwatering! I have a question, in your recipe for Madeleines you have 3 Tbsps and then nothing after it. Is that the lemon zest? Did I read it wrong? Lori: it is 3 Tbs of juice. Sorry but thank you for pointing that out! Hi, darling! You are so, so sweet - I'm absolutely thrilled for being nominated "Queen of Madeleines" by you, the Queen of desserts and all things sweet! 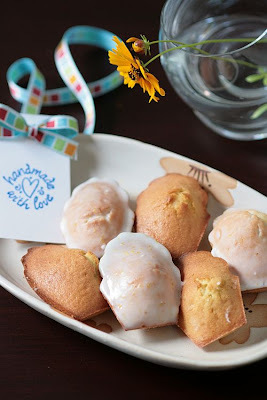 I'll be trying these lemon madeleines, you bet! Helen, I have some very old madeleine pans and am embarrassed to say I've NEVER made them before. *sigh* But I will now. And I am truly getting ready to bake my SHF entry too! I won't torture you by waiting until the last second this time. Mmmm these look delicious! As someone who has never made madeleines (yet!) I have to ask, do you prefer a silicon or a metal pan? I'm working on my SHF...but it has been too hot to bake. I will get it done though. Your madeleines look fabulous. I just make some white peach ones myself. Congratulations for your fabulous photo, well deserved! Is it madeleine month, because I'm seeing an awful lot of them popping up everywhere - I HAVE to get a tin to make some! They look yummy. I am going to make a batch this morning and then decide if I need to go buy a pan or three! I made my first lemon Madeleines this past week, for Tuesdays with Dorie. I wish I'd thought to make a glaze, yours look wonderful! These look soooo good! I wanna make them NOW...I mean, like NOW...leave work, drive to house, turn on oven, and start pumping these babies out!!!! I'm sure my boss would heart you!!!! thanks for sharing! who cares if e=mc2 when you have these gorgeous madeleines! Such a beautiful story, Helen, and I'm sure you're grandmother would have had a field day at Dehillerin! Your madeleines look lovely! I made them the other day and the kids wolfed them down, but usually we just buy them at the store, like most French families. They really do make decent packaged madeleines. If anyone wants to learn more about French madeleines, check out my little history page. Kind Regars.